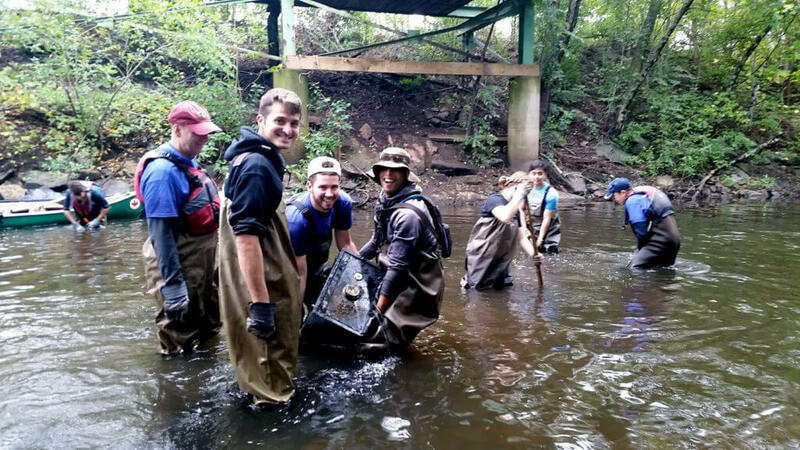 We organize two major river cleanups a year and we can use all the help we can get! Our annual spring cleanup is generally held along the Neponset Estuary in Milton, Dorchester and Quincy, and our annual fall cleanup tends to cover Hyde Park, Mattapan and Dorchester. Cleanups usually last for 3-4 hours and volunteers can work from boats or from land, and can work for just 1 hour or all 4. We provide all tools, gloves, bags, water and snacks. Folks should always come prepared to get dirty, and should dress for the weather (hats, sunscreen, closed toed shoes). The cleanups make a huge difference in the health of the River, and over the years we’ve picked up a mind-boggling array of debris, including abandoned cars, bicycles and motorcycles, tires, shopping carts, construction materials, dock pieces, flotsam and jetsam, and all manner of everyday trash. We’ve even pulled out a kitchen sink! Click here to view past cleanup photos.